There is a solid reason why the word “jumbo” is used to identify a certain type of mortgage loan. Typically, a jumbo loan is enormous in size when compared to an average home loan. For this reason, jumbo loans have a few special criteria that set them apart from other types of loans. First and foremost, the distinguishing factor that classifies a mortgage as a jumbo loan is the actual loan amount. In most areas, any mortgage loan above $484,350 will qualify as a jumbo. There are a few high cost areas, such as Los Angeles and New York where the threshold is closer to $600,000, but for the majority of the country the $484,350 rule of thumb holds true. Please note: we are discussing the size of the mortgage, not the price of the home. If a person buys a home for a price of $600,000 and pays $200,000 as a down payment, they will only finance $400,000, which falls below the Jumbo designation. There are several different ways for a person to buy a home with either no down payment or a small percentage down payment. The VA loan and FHA loan both come to mind for that type of scenario. However, a jumbo loan will normally require a large down payment. The down payment can range from 10% to 20%, with 20% being the norm. Some lenders have introduced a 5% down option. Since the borrower is financing more than 80% of the home’s value there will be a private mortgage insurance requirement. In addition to the private mortgage insurance the lender may have slightly stricter rules for approving the borrower with only a 5% down payment. There is not a single governing body for Jumbo Loans. This means that each lender is allowed to develop its own set of criteria for approving these large loans. It also means that a rate and term offered by one lender could be very different from another lender. Other types of loans are governed by various groups. For example, while the Veterans Administration does not offer home loans, they provide rules and guidelines for the VA home loans. Qualified banks, credit unions and mortgage lenders must submit loans that meet those guidelines in order to get the VA guarantee in the event the loan is not repaid. Similar circumstances exist for FHA loans, the rural property loans offered by USDA and conventional loans offered by Fannie Mae and Freddie Mac. Jumbo loans are offered with both fixed rates and adjustable rates. When comparing a jumbo mortgage rate to a similar conventional or government loan it will be apparent that the jumbo loan has a higher rate. Once again, this is due to risk. The lender is taking a bigger risk offering a larger loan and wish to be compensated, in the form of higher interest. 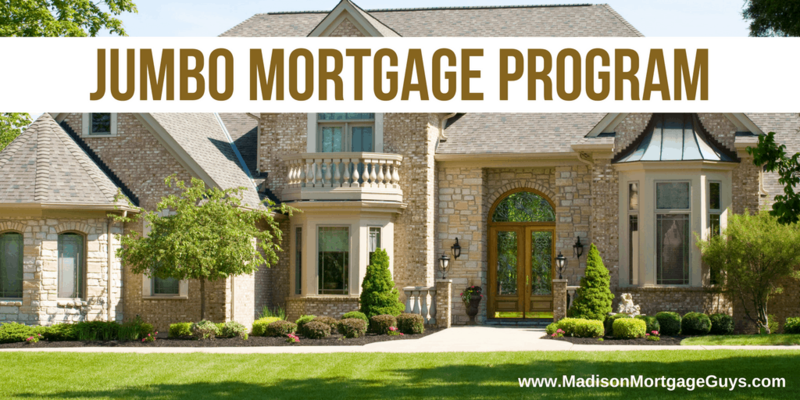 The majority of the time, a jumbo mortgage is approved for a person’s primary residence. While it can be possible to get approved for a jumbo loan on a second home or a vacation property, it has much tighter restrictions. Unimproved land or mobile homes are almost universally not allowed for a jumbo mortgage. Besides the loan amount, the credit scores for a jumbo loan are another important factor. While rules will vary from lender to lender, it is next to impossible to get approved for a jumbo mortgage with credit scores below an A rating. If someone with less than perfect credit attempts to get a jumbo loan, they will likely need a sizable down payment along with substantial reserves (discussed later). The reason for the high credit score requirement is quite simple; banks and lenders that offer jumbo loans are accepting a sizable risk due to the enormity of the loan. Thus, they want to minimize the risk by lending to people who have proven they can repay their bills on time with a strong credit history. Most lenders that provide a jumbo mortgage want to put some safety nets in place to give the borrower the best chance of repaying the loan. One of those safety nets is a conservative approach to debt to income ratio. Each lender will have its own guidelines for the DTI ratio. Some lenders may even have a separate ratio for comparing the proposed mortgage payment to the monthly income separately from the other debt. The goal of the DTI ratio rule is to make sure the borrower has enough money left over every month, after all the bills are paid, to cover other things like electricity, water, clothes, food and other necessities. The VA home loan has used a similar debt ratio guideline for years and they have the lowest number of foreclosures among all types of mortgages. Although it is not specific to jumbo loans, reserves are used more frequently with jumbo mortgages than other types of loans. Depending on the size of the mortgage loan, a lender may require the borrower to have reserves equal to 3 – 6 months of the proposed mortgage payment. Bigger loans may require higher reserves. The term reserves refer to funds a person may have in a variety of sources such as checking accounts, savings accounts, money market funds, stock and bond investments and retirement accounts. In order for the reserves to be eligible, the borrower must be able to access the funds within 30 days. In financial terms, the funds are liquid if the person can access the funds in a short time frame. For example, if a person has a substantial amount of money in their employer’s retirement plan and the plan allows for withdrawals while still employed, that is considered liquid. The requirement of a certain amount of reserves is used as another way to reduce the risk that the loan will not be paid back. If a person has 12 months of reserves save in their primary money market account and their retirement account, they will be able to continue making their house payment in the event of losing a job or suffering an injury that keeps them off work for several months. Like other mortgage loans, jumbo mortgages are offered with both fixed rate terms and adjustable rate terms. For fixed rate loans, the rate will be the same for the duration of the loan. The loan term can be as short as 3 years and go up to 30 years. If a lender is willing to provide a fixed rate, they will likely ask for a larger down payment. Most lenders will ask for 20% down to extend a fixed rate. With this type of down payment requirement, it provides added assurance that the customer is committed to repaying the loan and not as likely to walk away from the property in the event of financial hardship. It is more common for a jumbo mortgage to be approved with an adjustable rate loan. Typically, the adjustable rate mortgage (ARM for short) will include a designated fixed period followed by an adjustable period. This means the interest rate will not change for the fixed period. The fixed period for ARM’s can range from 3 year up to 10 years, depending on the lender. Once the fixed period is over, the interest rate can go up or down based on a specific index that the lender chooses as a benchmark for the loan. Many buyers use the fixed term to pay extra money towards the mortgage. When the fixed term is over the goal is to have the balance low enough to refinance to a fixed rate with a conventional mortgage under $484,350. Jumbo mortgages have been used by affluent people for years to acquire nice homes in some of the best areas of the country. Thanks to lenders broadening their approval guidelines, more people are now eligible for these loans than ever before. *5% down payment on $625,000 purchase price, 3.250% / 3.772% APR, 740 FICO, 7/1 ARM mortgage. Mortgage insurance is required. The initial rate is subject to increase after the initial fixed rate period of 7 years ends. Rates subject to change. Subject to credit approval.